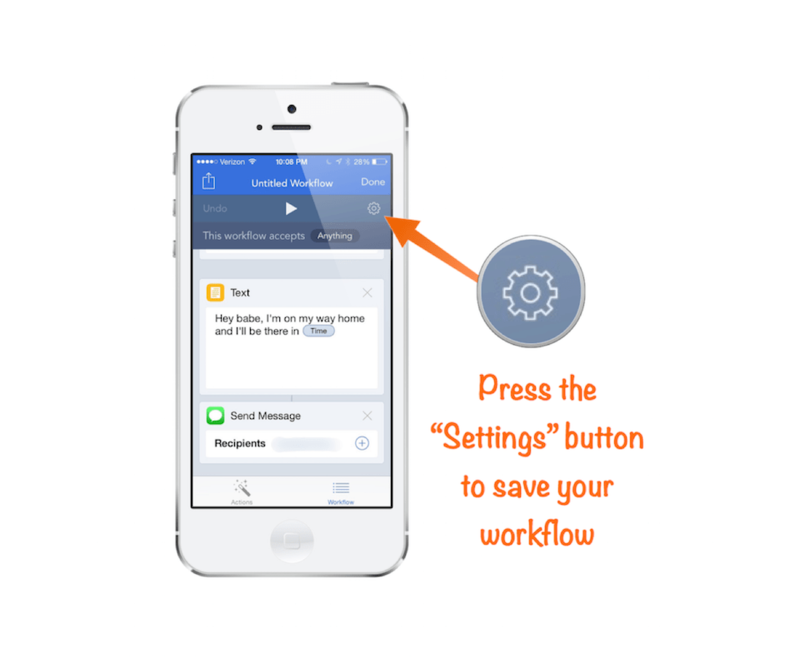 With Workflow yout can simply automate your workflows step-by-step in iOS 8 . I’m not a code-guy, so for smart workflows I refer to the input of smart people, like Federico Viticci1, Erik Pramono 2, Phillip Gruneich3, Cam Brennan4, Timothy Reavis5 and others. How long will you sleep? Ever wish you could do more with your iPhone? Ever struggle to get iOS to do what would take you only a few seconds to do on your Mac? One of the biggest problems with iOS is that everything is “sandboxed”, meaning that it’s very hard to move things from one application to another like you can on your Mac. Apps on iOS tend to function independently and until iOS 8 brought extensions it was pretty much impossible to get them to work together. The touch interface can also cause problems, making it difficult to drag things between apps or even to copy and paste accurately. It’s not that you necessarily can’t do these things, but because everything in iOS is always full screen it just makes it harder and take longer. Fortunately, Workflow is here to save the day. This essential iOS app has quickly become one of my favorite iOS productivity apps and is beginning to change how I use my iOS device and what I use it for. In this article, I want to introduce you to Workflow and show you some of the neat things it can do, show you the different types of workflows you can build, and how to use it with other awesome productivity apps like Drafts and Launch Center Pro. 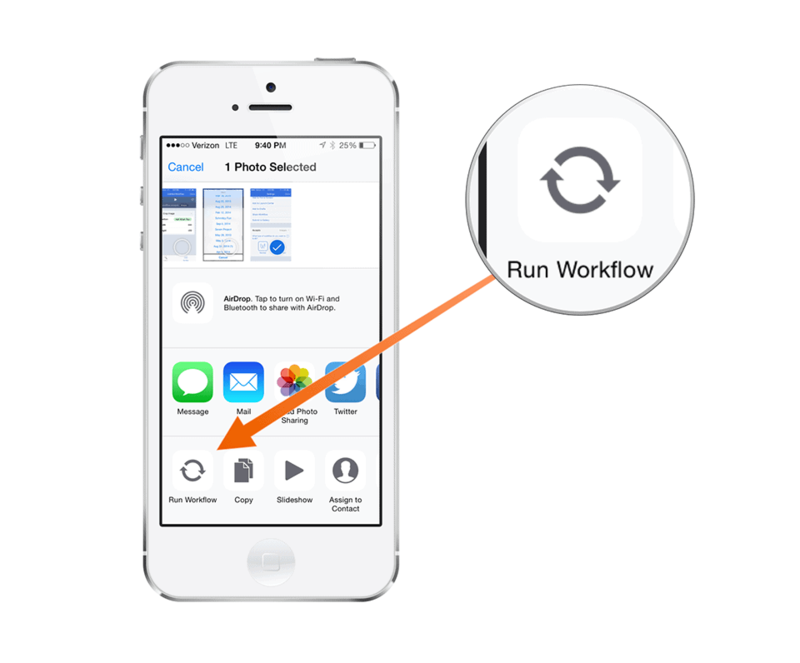 The best way to describe Workflow is as Automator for your iOS device. And if that definition doesn’t make sense yet, that’s ok – you’re probably having a hard time picturing it because there simply isn’t anything else like Workflow on the App Store right now to compare it to. Essentially what Workflow does is allow you string together and automate iOS apps and features (including native apps) in an intuitive interface, then save those “workflows” to be used later. This results in your iOS device being able to do many things you previously couldn’t, and also making everyday tasks much quicker and easier. Basically, Workflow makes your iOS device Asian Efficient. If you don’t have it yet, you can download it from the iTunes App Store for $2.99. 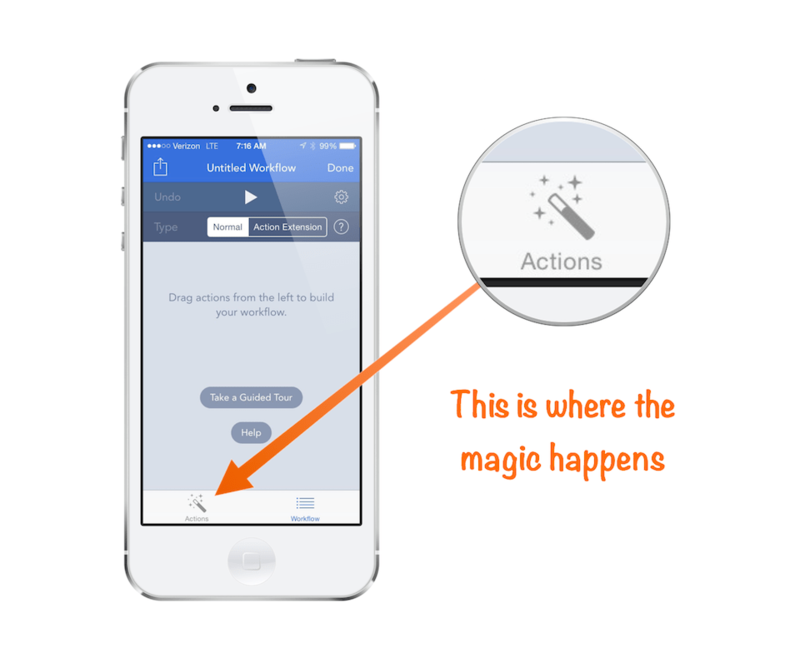 The building blocks of Workflow are called Actions. An action tells an iOS app to do a specific thing, and can be linked together using the “Content Graph” to execute a string of commands with a single tap (more on this in a minute). For example, when you open the app for the first time there’s a built-in tutorial for creating an app that makes an animated gif by taking a series of photos and then combining all the images using a “Make GIF” action. What you see when you run the workflow is the camera open up where you take 3 pictures and then Workflow does the rest, combining the images and previewing the file for you. You can even have it share the file automatically to social media if you want to add that final step. Where things really get interesting though is when you start using Workflow’s ability to parse information from the stock iOS apps and use it in other apps. For example, you can create a workflow that uses the “Get Current Location” action from the Maps app, then use that information to calculate how far you are from home by using the “Get Travel Time” action, and then grab that information to send your significant other a text that says “Hey babe, I’m on my way home and I’ll be there in 23 minutes” using the “Send Message” action. You now have a screen where there are 2 tabs on the bottom: “Actions” (where you’ll select the building blocks for the workflow) and “Workflow”, which is where we put things together. When you first press “Create Workflow”, you’re taken to the “Workflow” tab. The first thing you need to do is to add an Action, so press the “Actions” tab. You’ll notice the actions are broken down into categories, so you may have to dig a little bit to find what you’re looking for. In our case, we want to set the address you want to get directions to so we will use the “Street Address” action under the “Maps” category. To add this action to your workflow, just drag it to the right of the screen and the app will automatically switch to the “Workflow” tab. Once you have your address entered, go back and grab our next action, “Get Travel Time” (also under the “Maps” category) and drag it to the right to add it to our workflow. You can choose what transportation mode you want to use, but I’m going to use “Driving” for this example. If we were to run our workflow right now we will get the travel time to our home from our current location, but we want to be able to do something with this information so we’re going to need to use another action to “save” this information. The way we’ll do this is by using the “Set Variable” action under the “Scripting” category (I know, I just said you don’t need to know anything about scripting. You really don’t, this is just the category it’s saved in. The Workflow developers are really smart and it can do some crazy scripting stuff, but you don’t have to dive in that deep for Workflow to still be useful for you). The next thing we need to do is compose the message with the variable in it, so we’re going to select the “Text” action (under “Text”, in case you were wondering). 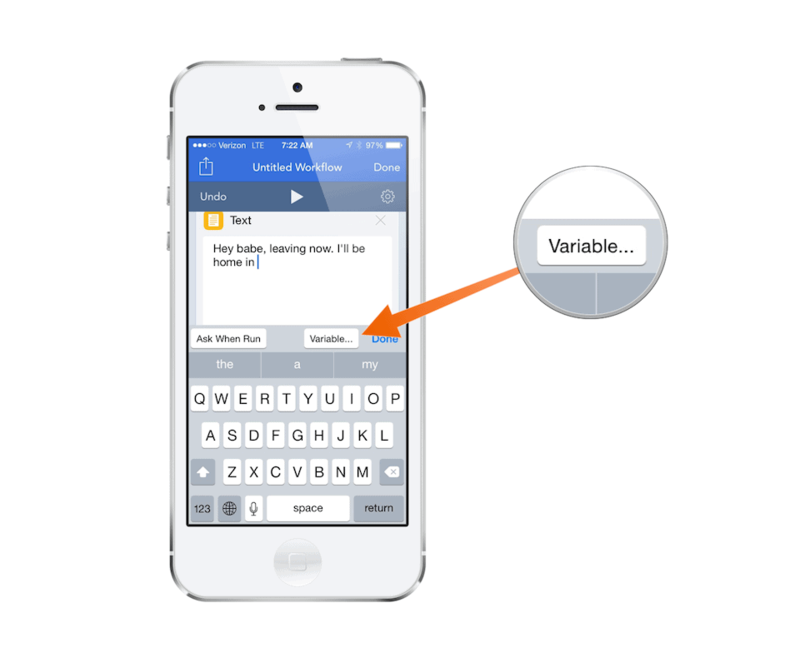 Type your message and select the “Variable…” button to place the variable information (travel time) in the appropriate place in your message. Now the final step is to actually send this message to our significant other. 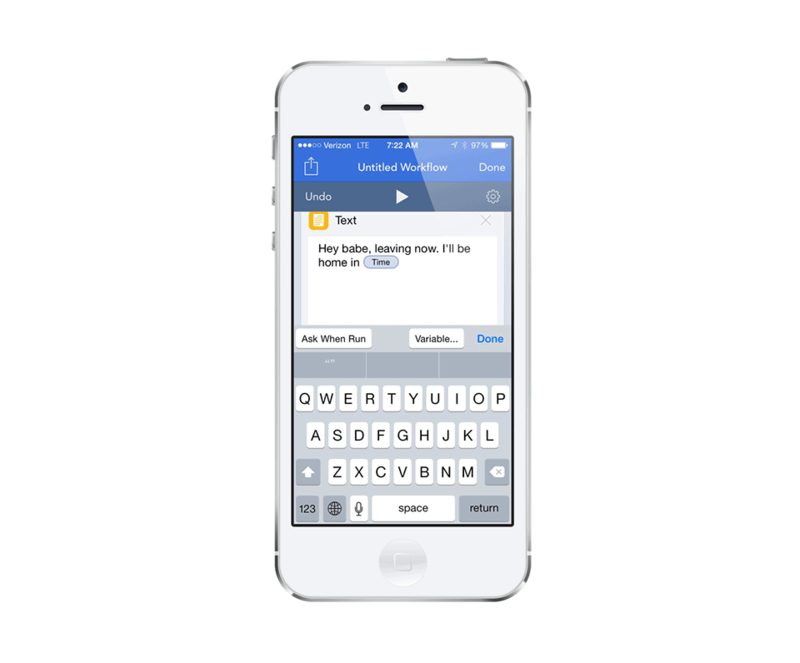 To do this, select the “Send Message” action (under “Sharing”). Put in the recipients phone number or email and we’re done! Your workflow should run and end up in the Messages app with a text message. Type in a new name for your workflow (something like “On My Way”) and choose a new icon if you’d like. You can then see some options where we can Add to Home Screen (where we can run this workflow just like an app from our home screen), we can add it to Launch Center, add it to Drafts, or share it with someone else. You can even submit it to the gallery if you want other people to be able to use this workflow (might want to strip out your sensitive information first though). Lastly, you can select the type of workflow. 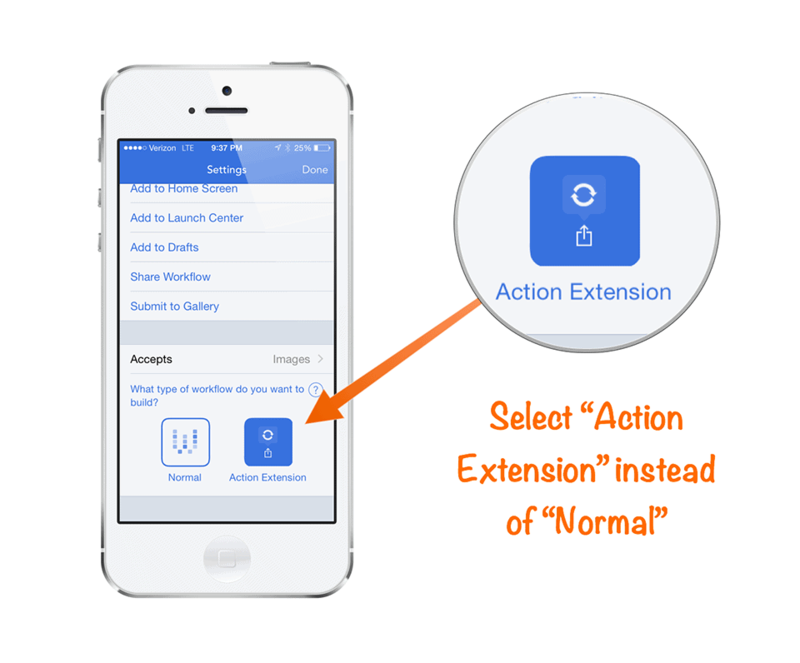 There are 2 types available: Normal, and Action Extension. Normal is what we’ll use in this example, and allows the workflow to be run by selecting it from the content graph, running it from the home screen, etc. 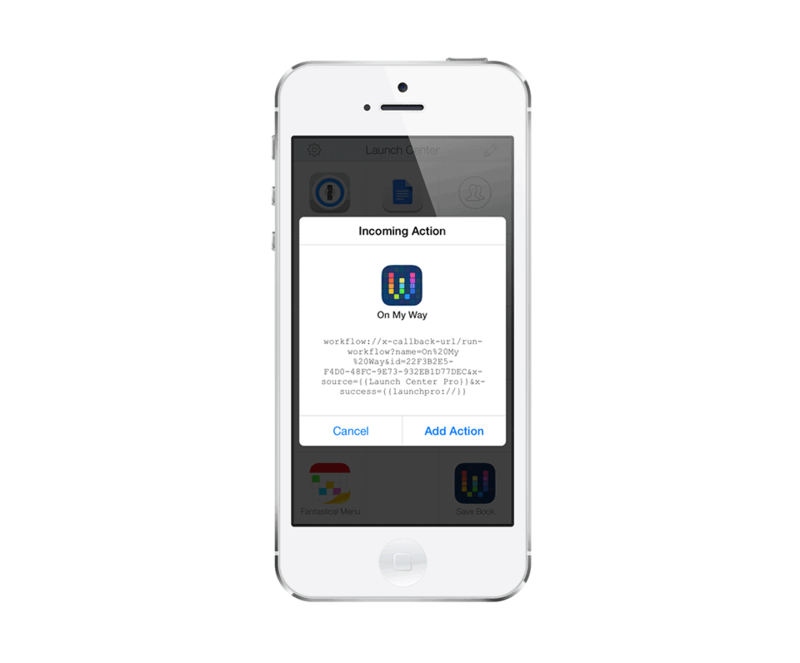 The Action Extension option allows the workflow to be run from the share sheet in other apps, eliminating the need to even open Workflow in order to launch it. This can be very handy when working with things like dates, contacts, email addresses, images, phone numbers, etc. 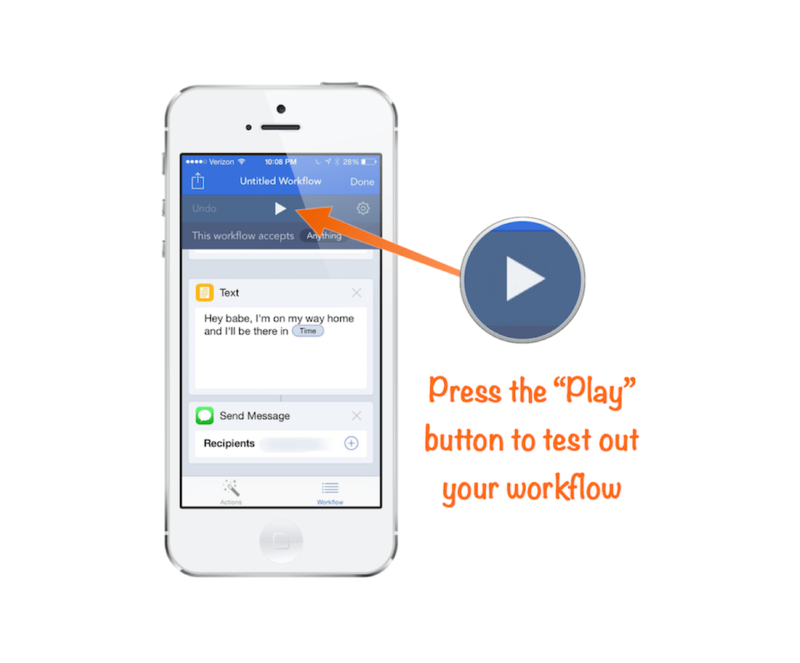 because Workflow can recognize that information and do things with it. 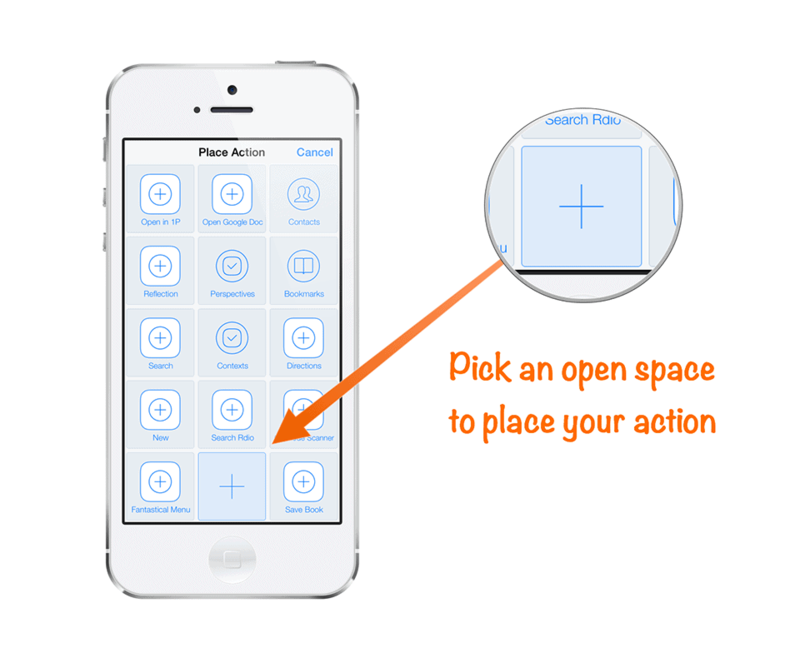 Here’s an example image cropping workflow that works great as an action extension. Let’s walk through how to set up this workflow. This will open a list where you can select the different file types you want this workflow to support. Since this is an image editing workflow, make sure that “Images” is selected. Next we’ll want to do something with this cropped image, so select the “Save to Photo Album” action. You can even choose where to save it, which can be handy when putting together an article like this because I could keep all the images from my iOS device in a “Screenshots” folder, for example. Go ahead and save this workflow as “Crop & Save”, and double check to make sure that “Action Extension” is selected instead of “Normal” under the “What type of workflow do you want to build?” section. 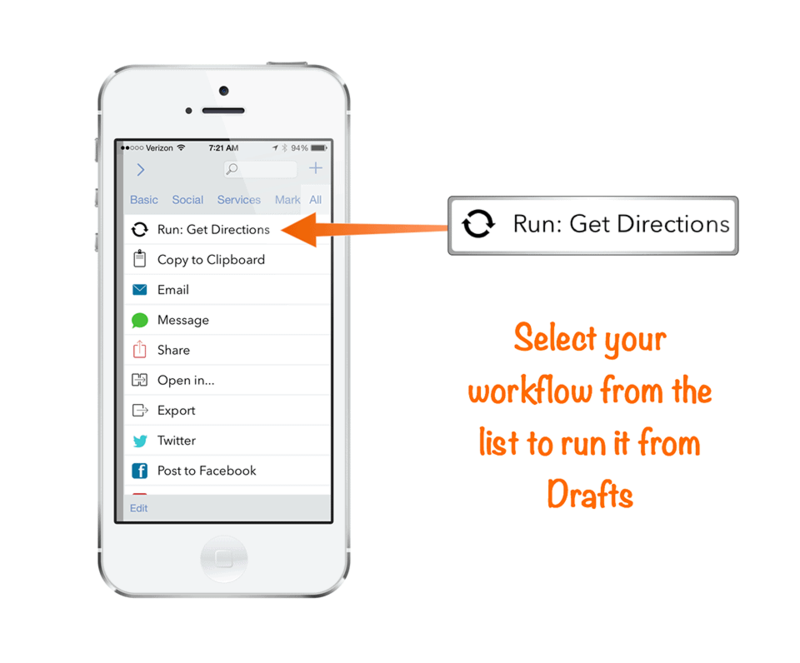 Press the “Run Workflow” button and you’ll see the available options. Select the “Crop & Save” workflow we just created, select where you want the crop to take place, and your image will be automagically cropped and saved to the location you specified in the workflow. Warning: You are now entering the Nerd Zone. This section is not for the faint of heart, and I will be covering some advanced features. If you’re not obsessed with maximizing your iOS productivity and efficiency, turn back now. With that disclaimer out of the way, I’ve got a couple more really cool things to show you if you’re interested in tweaking Workflow to really make your iOS device Asian Efficient. I love Drafts. It’s the app I use most often on my iPhone, and is one of the first productivity tools I recommend for people looking to get more out of their iOS device. Drafts brands itself as “the place where text originates on iOS” and it really has become that for me. The basic idea is that you enter your text in Drafts first and then use an export action to put that text in the appropriate place (text message, email, Facebook update, etc.). This takes a little getting used to because the natural inclination is to just start typing in the app where you think it will end up (like a text message), but when you start typing a text message that gets too long and you decide it really belongs in an email instead Drafts can save you the trouble of having to select the text (which is not easy on an iOS device) to copy & paste it in the correct application. Recently, the developers of Drafts and Workflow got together and provided support for each other’s apps. This means that you can use Drafts content as actions in Workflow, but more importantly it means you can run workflows straight from Drafts. This may not seem like a big deal, but once you’ve been using Drafts for awhile you’ll get it. Let me give you a practical example. There are other things you can do with an address, but you get the idea. So you could enter the info 3 times into 3 separate apps, OR you could use Drafts, enter it once, and export it to 3 different places. I personally don’t like retyping things on my iOS keyboard because it’s not very efficient and the keyboard is tiny, so I’ll opt for the second option. The reason this is even an option is because of Workflow. Drafts can export to many different services out of the box, but it can’t parse that information to be used in default Apple apps – that’s where Workflow comes in. You can take that same text out of Drafts and export it using different workflows (or combining them all into one workflow if you prefer). Let me show you how this works by taking just the first example, getting directions. Let’s break this down step by step. This will open the Export Actions menu. Navigate to the tab where you saved your workflow and select it from the list and it will open the Workflow app and run your workflow. When you run this workflow, it will take your text (address) and enter it into the Maps app, then get driving direction from your current location. Best of all, the address is saved in a draft in Drafts (not in the maps app), so if you need to repeat the process later and export the address somewhere else it’s already there for you. If you’re not familiar with Launch Center Pro, it’s an app that’s been around for awhile that basically operates like a speed dial for your iOS device. It was one of the first apps (if not the first) to support the x-callback URL scheme (here’s a great article over at MacStories if you want to learn more about it works), which was really the only way you could automate your iOS device until recently. As an example, you can check out this Day One Launch Center Pro action I created which allows you to answer a couple questions in LCP and then logs the answers as a table in a Day One journal entry (you can install it without understanding the code). On the surface, it might appear that Workflow and Launch Center Pro serve similar functions, and that can be true to a certain degree. The main difference is that Workflow gives you much more granular control over the automation process, and Launch Center Pro offers a much cleaner quick launch interface. 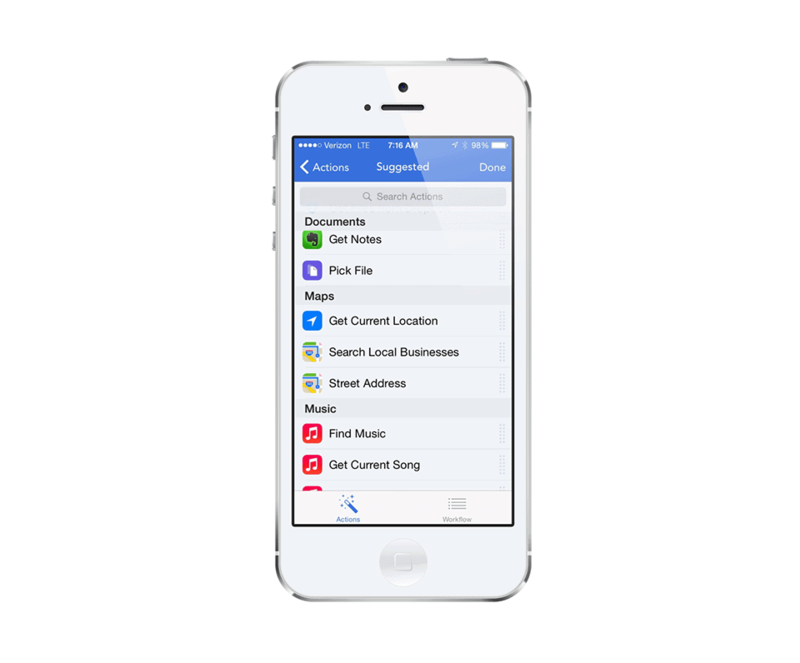 Workflow is for automating actions on your iOS device, and Launch Center Pro is for quickly launching those actions. For example, you might have noticed the buttons labeled “Perspectives” or “Contexts” on my Launch Center Pro screen – those are actually folders with quick links directly to my OmniFocus contexts & perspectives on my iOS device (here’s the Michael Schechter post that taught me how to do it in case you’re interested). I just select the appropriate item, it opens OmniFocus and takes me right to that context/perspective. 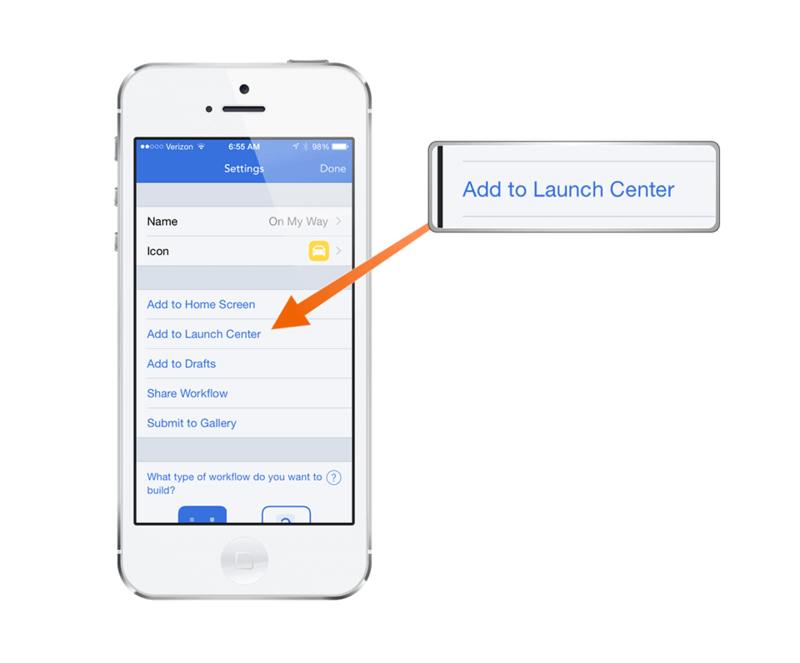 Now you can launch the workflow by selecting it from Launch Center Pro. One of the coolest things about Workflow is how easy it is to share your workflows once you create them. Just go to the “Settings” screen and press the “Share Workflow” button. 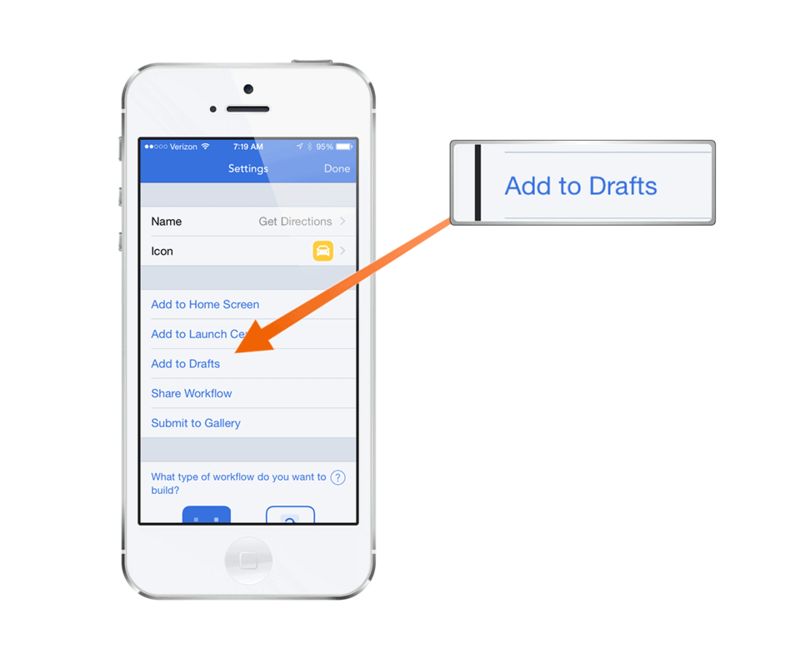 The share sheet will open with several options for sharing your workflow, the most basic of which is “Copy Link.” This creates a unique Workflow URL that you can share, and all you need to do to install a workflow like this is just open the URL (on your iOS device) and the workflow will automatically be installed. This is great because you don’t need to understand all the specifics about how a workflow works in order to actually use it. Why reinvent the wheel when a lot of very smart people have been creating and sharing workflows on the internet already? So with that in mind, here are 10 basic workflows to get you started. All you need to do to install these is open them on your iOS device. 1. Upload Last Photo to Dropbox – this workflow takes the last photo taken and uploads it to your Dropbox account (you can pick the folder where it saves the image) and copies the URL to share the file to your clipboard. Cloud File Picker – this workflow allows you to pick a file from iCloud, Dropbox, Google Drive, etc. and open it on your iOS device by picking the app you want to open it in. QR Code Reader – this is a basic workflow that allows you to scan and open QR codes. Make PDF – this workflow takes rich text or URLs and makes a PDF out of the selected content. Shorten URL – this workflow shortens the currently selected URL. Save from Instagram – this workflow allows you to download images from Instagram by selecting the 3 dots and selecting “Copy Share URL” then running this workflow. Airdrop & Delete Screenshot – this workflow takes your last screenshot from your iOS device and sends it to your Mac using AirDrop, then deletes the screenshot from your iOS device (keeping your photos clean). Open in Chrome – this simple workflow simply takes the current URL and opens it in Chrome instead of Safari. Get Lyrics From Currently Playing Song – this workflow takes the currently playing artist and song from the Music app and finds the lyrics via a Google search. 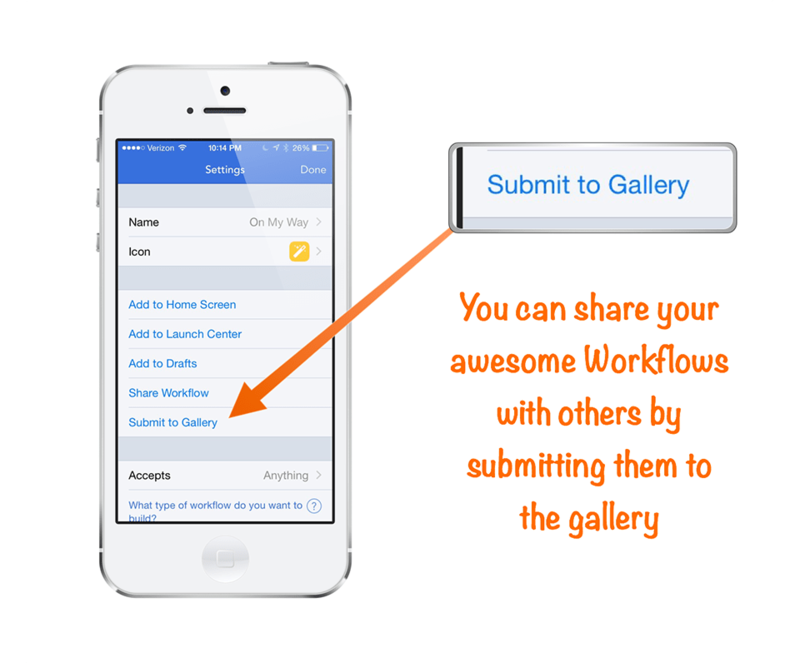 There are a lot of other great workflows available to download through Workflow’s built-in Gallery. If you want some more awesome workflows, these are 10 of my favorites from around the web. These workflows are a bit more advanced, and I’ve included links to the author’s site where I could find them that offer more detailed explanations of what the workflows actually do. You might need to customize these a little bit, so if you need some help getting these up and running I highly recommend you check out the author’s site if you’re interested in really making these work for you. 1. Append to Evernote Reading List (source: brettkelly.org) – This is the workflow that got me hooked on the Workflow app. Basically what it does is take the Amazon mobile URL for a book and strip out all the junk, then add the book title as a link (with the URL of the actual book) to an Evernote “Book Queue” list. Evernote Web Clipper for iOS (source: sayzlim.net) – this workflow works similar to the Evernote Web Clipper does on your Mac, by taking the page you are on and clipping the page as a PDF and adding it to Evernote. Record Expense (source: brettkelly.org) – This workflow will take some tweaking, but it’s pretty awesome. When you run it, it prompts you for the expense category, then the expense amount, then opens the camera so you can take a picture of the receipt, and finally sends ALL of this to Evernote. YouTube to HuffDuffer (source: 512pixels.net) – This genius workflow strips the audio from a YouTube video and uploads it using Huffduffer so you can listen to it in your podcast app. Affiliate Links on iOS (source: techedvance.com) – This workflow takes Amazon or iTunes links and adds your affiliate code. To run it, you must have Clean Links installed and you must copy the URL to your clipboard before running the workflow. Convert Spreadsheets to Markdown Tables (source: macstories.net) – I hate Excel with the intensity of 1000 suns, so I love this workflow because it allows you to get the data out of a spreadsheet and put it into a Markdown table. Very handy if you love Markdown as much as I do. Wayback a Dead URL (source: Workflow Gallery) – Ever visit a webpage and it’s been taken down? This workflow allows you to still find the page by using the internet’s Way Back Machine. Very handy. Send Pic Everywhere (source: discussed on Episode 243 of Mac Power Users) – We all have family members who aren’t on Instagram (or other social media sites) to see pictures when they are posted. While my mom and dad don’t care about the meal I ate last night, they do still like to see pictures of their grandkids. 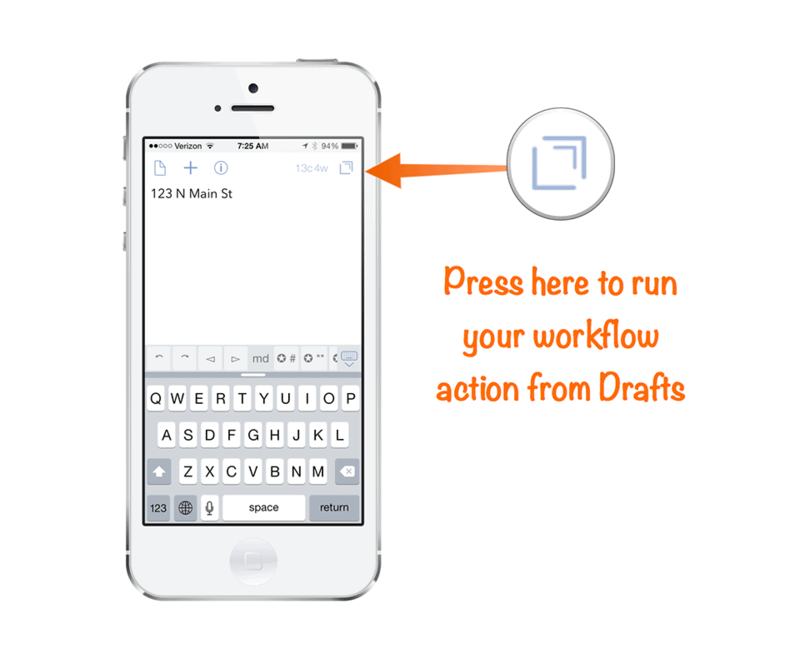 This workflow posts the picture to social media sites and also gives the option to send via SMS. Take a Note (Audio/Video/Text) (source: thoughtasylum.com) – I use Drafts as my quick capture tool of choice, but it’s limited to text. This handy workflow prompts you when you run it to select audio, video, or text and then opens up the appropriate capture tool, combines all the appropriate info (date, time, etc.) and saves everything to Evernote. Time Sensitive Dropbox Links: 1 Day | 1 Week (source: plobo.net) – This workflow will require you to set up some Hazel rules on your Mac. Basically what it does is move a file to a specific Dropbox folder (i.e. “1 Day”) and copies the share URL, but Hazel is watching the folder and removes the file after a specified period of time. Pretty clever. If you’re looking to do more with Workflow, these are a couple excellent resources that can help you take your Workflow game to the next level. If you create any awesome workflows, I’d love to see them! Feel free to post your workflow links in the comments. I spend a lot of time in meetings at work. While I try to keep meetings brief and ideally no more than 30 minutes, meetings still make up a large part of my day. I want to make sure time spent in meetings is effective and people don’t forget what was discussed and agreed. I decided to try and make the process of recording meeting minutes faster by using my iPad. This workflow uses the information in a calendar invite to populate a meeting note template in Drafts. 1. 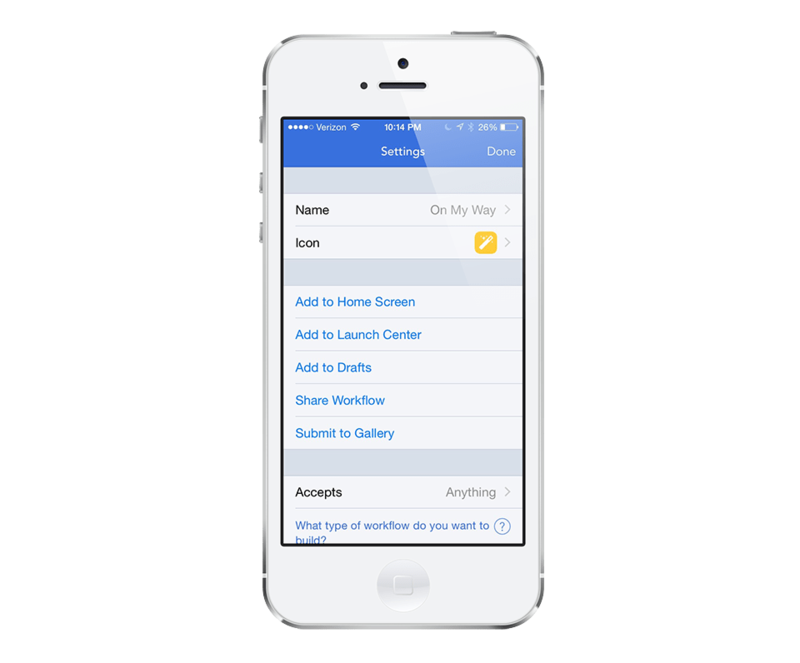 The workflow will first prompt you to select an event from your calendar. By default it is set to display the next 10 events for you to select from. Read the whole article here and get the workflow! If you’re a fan of automation in iOS and continuously strive to make common tasks easier, you’ve probably already been introduced to Workflow, an incredible app that enables users to create workflows, or recipes of tasks for the app to perform when invoked. The potential of this tool is incredibly far-reaching, and this article explores a few ways in which Workflow can be a must-have app. This is one of a couple workflows featured here that was created by yours truly. Made with the intention of being customizable by anyone who downloads it, Remind Me To displays a list of preset reminders that you find yourself repeatedly adding to your to-do list – things like picking up milk or emailing a report – and tapping the one you want instantly adds it to Reminders.app. You can choose to add multiple reminders at a time, or turn that functionality off if it’s speed you want, and there’s also an option for adding a custom reminder directly from the workflow to keep things unified. While the linked template is set up to use iOS’s stock Reminders app, it can easily be modified to support Fantastical or Clear, if you’re a fan. Additionally, some minor modifications can allow specific preset reminders to be added with a due date or other metadata. Tweak this to suit your preference, and it can quickly streamline your frequently-added reminders. I frequently find myself tweeting interesting links I run across or emailing them to a friend, but quite often the URL is a long, messy glob of text that is simply ugly. The obvious answer is a URL shortening service, but having to fire up Safari or find the service’s app is cumbersome. However, there’s a ‘flow for that, which makes the task of shortening a URL and copying it to your clipboard a much simpler process, and it conveniently works both from inside the Workflow app and from the Safari extension. 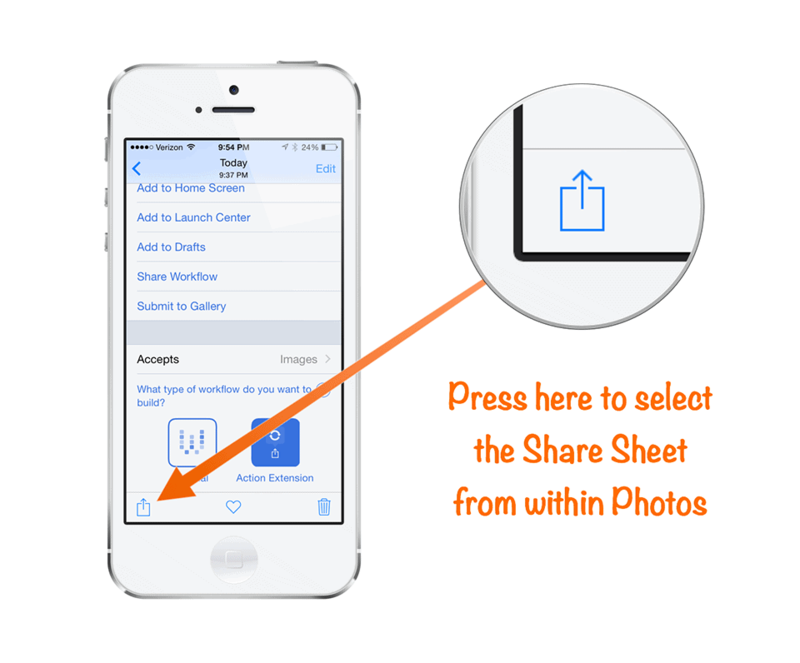 Consider modifying it to pull up a share sheet if that better to you. If you’re a web developer or if you deal with the source code of webpages at all, this is an excellent workflow to add to your collection. When browsing in Safari, invoking View Source from the share sheet displays the current webpage’s source code in a Quick Look view and gives the options to share the code through your available channels, or save it to iCloud Drive for future access on any of your devices. Read the whole article and more examples of workflows here. The Photo Message Gun With Workflow.app. This is another example of using Workflow.app to turn tedium into simplicity (see [this recent post] for other examples). 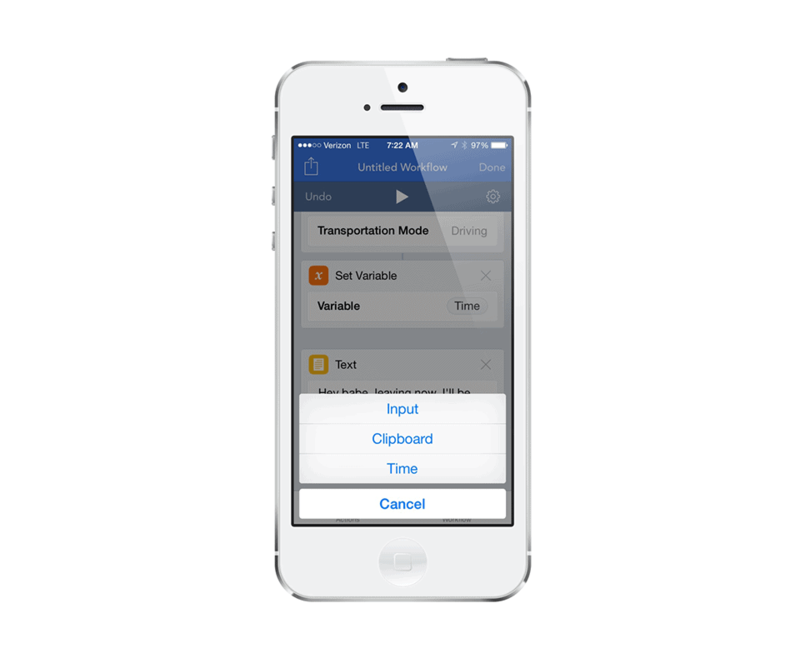 It also demonstrates the Workflow.app control flow actions. Here’s the user story: I like to send photo messages to people but I really don’t need (or want) to use group messaging if they don’t know each other. Being forced to compose the same message multiple times usually means I leave some people out. I want to write a message once, attach some photos, and send it in one go. Repetitive tasks like this are prime for automation. Let’s fire up Workflow for iOS and solve this problem. We start by asking for some input. First we ask for a photo and then immediately save that to a variable for later. We follow up by asking for a text message that will be sent to everyone and add that to the same variable. 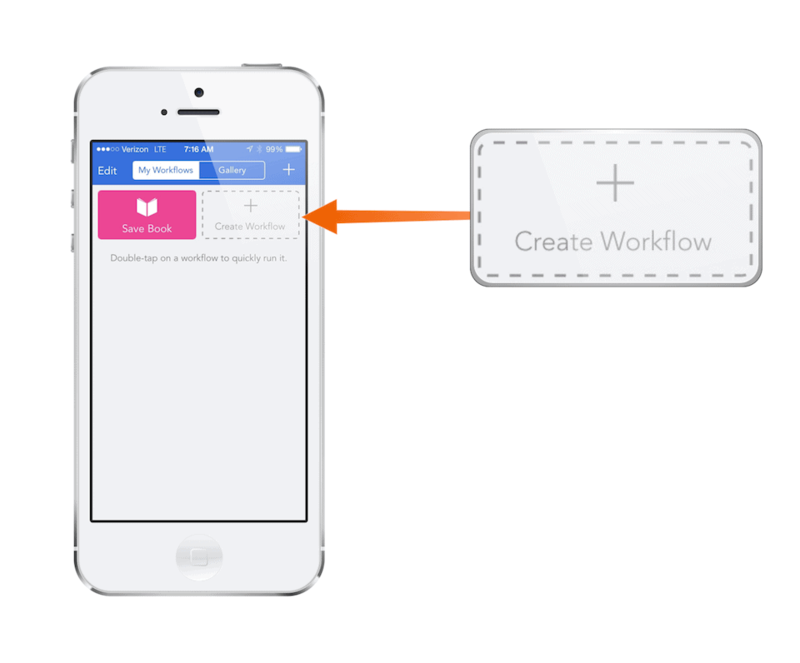 Workflow (website) (App Store) is one of the most powerful apps available for the iPhone and iPad. Using Workflow, you can combine functions from different applications to make things happen on your iPhone and iPad wicked fast. 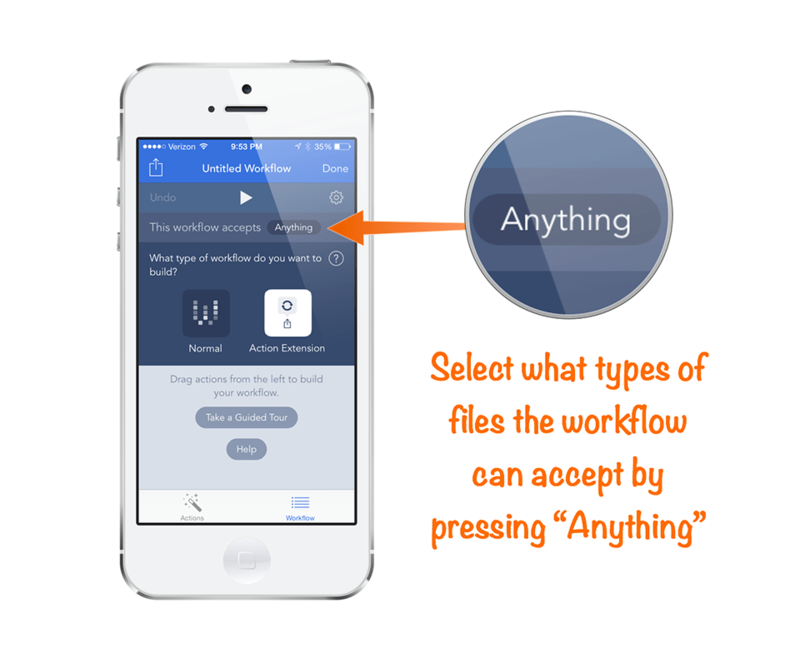 Because it’s so flexible, Workflow is difficult to get started with. That’s where this video field guide comes in. The Workflow Video Field Guide starts with a few, easy workflows and builds upon them over the course of an hour to turn you into a Workflow pro. By the time you get to the end, you’ll be able to roll your own workflows and change the way you work on your iPhone and iPad. Build your own animated GIF and share it. 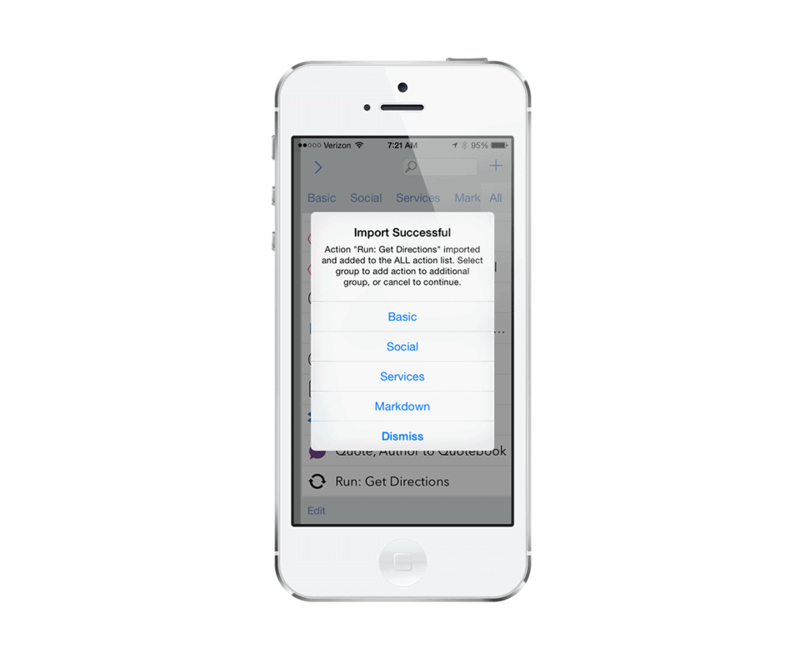 Automate notifications to family and friends when you’re running late. Send a message to your family so they know when to expect you home. Get a Google Street View picture of the address of your next appointment. 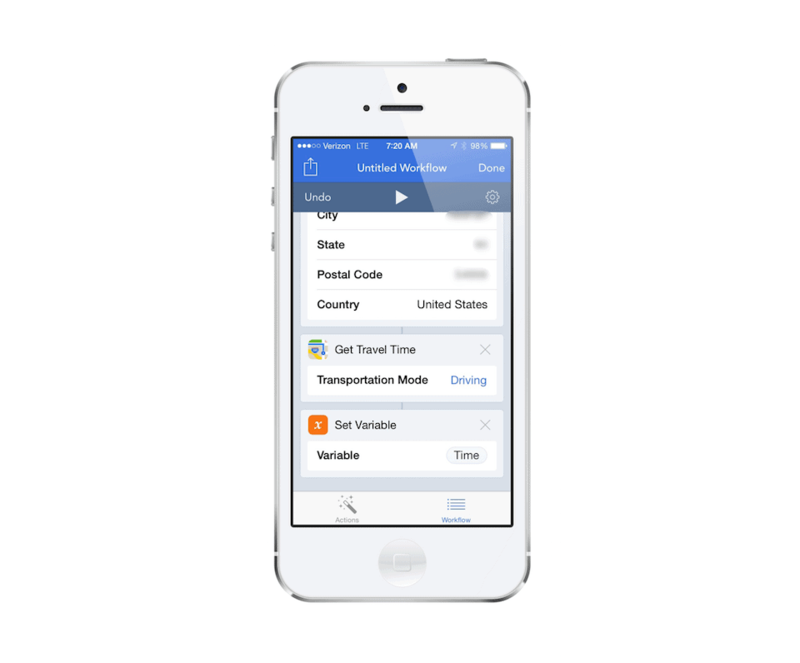 Have your phone automatically give you the travel time and directions to your next appointment. 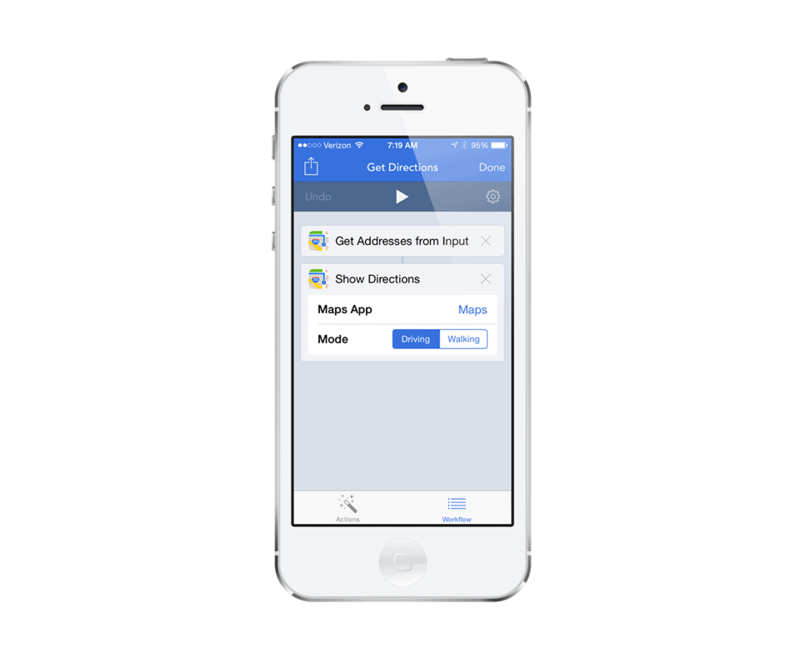 Share your location with friends and family with one tap. Easily send screenshots to your Mac via AirDrop. Automatically send photos from your phone to your Mac. 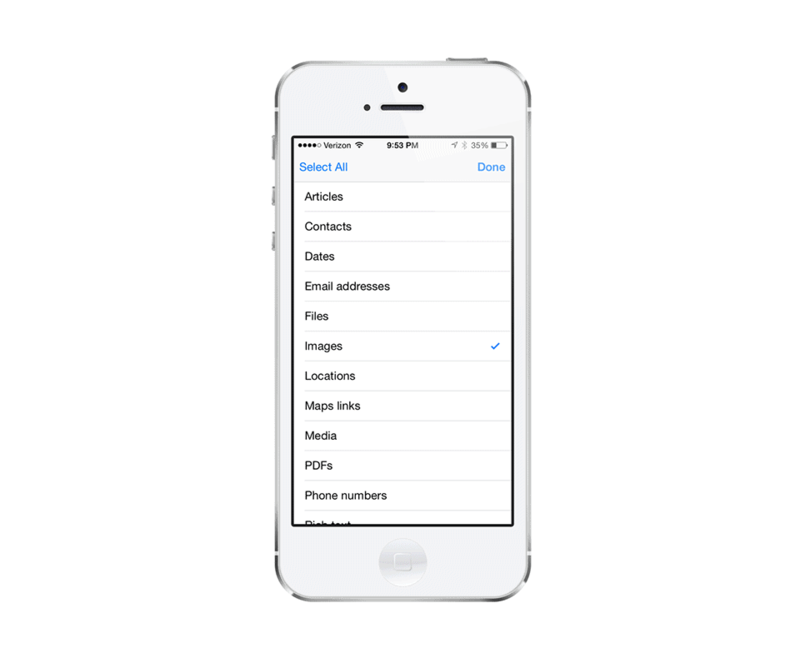 Have your iPhone show the location of your photos on a map. Convert images to different file formats automatically. 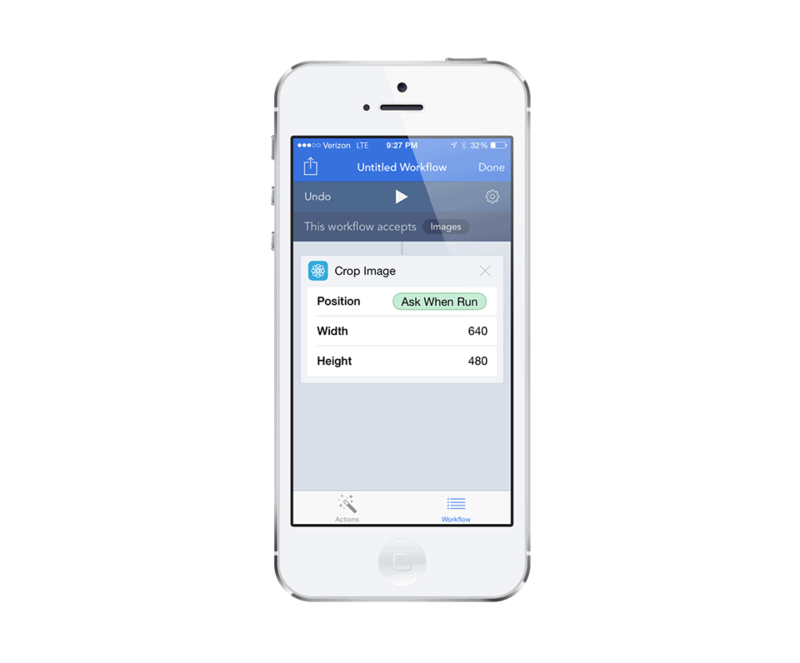 Blast photos out to multiple sharing services with one workflow. Share your most played music. Get walking directions to the nearest coffee or tea shop. Have your iPhone or iPad look at your calendar for a given day and prepare a message displaying your availability. Create a custom workflow to take a picture of a receipt, give it a custom name, and save it to Dropbox. 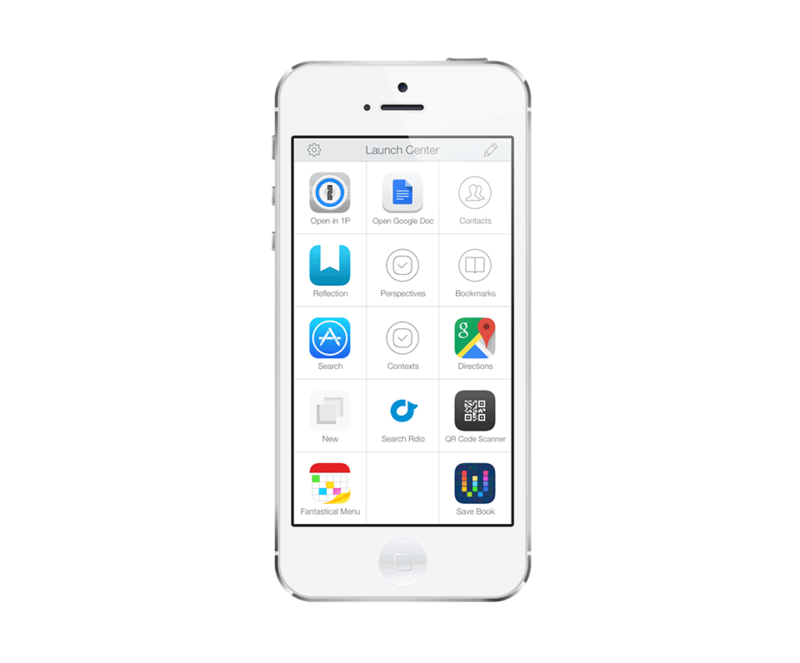 Set up a workflow to check your battery level, adjust your screen brightness, and send you a message. 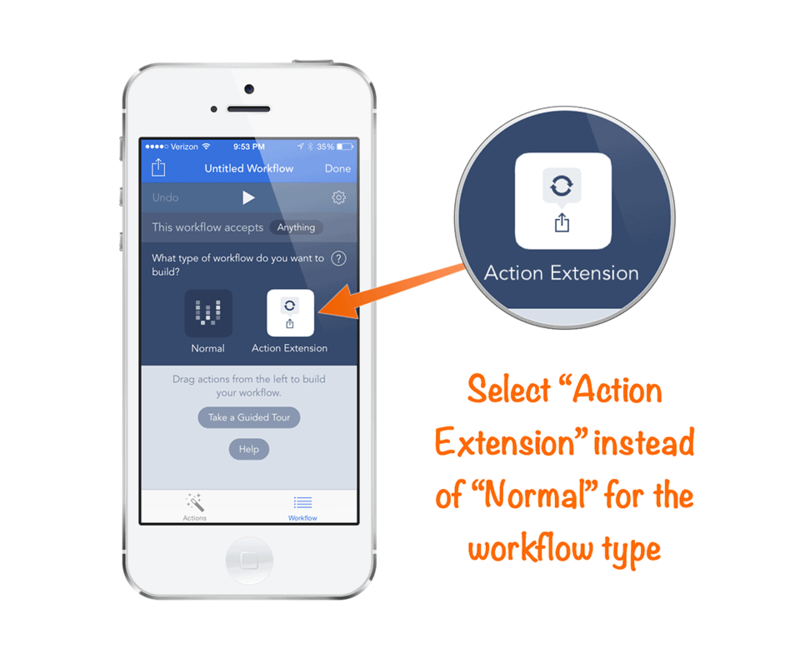 Workflow has over 200 available actions that you can mix and match to make your iPhone and iPad dance for you. Don’t you want to see that? This screencast is fully bookmarked, an hour long, and engineered to make you a Workflow master. You can download the Workflow Field Guide for $9.99. Did you say you’d like to see a sample? Then here you go!